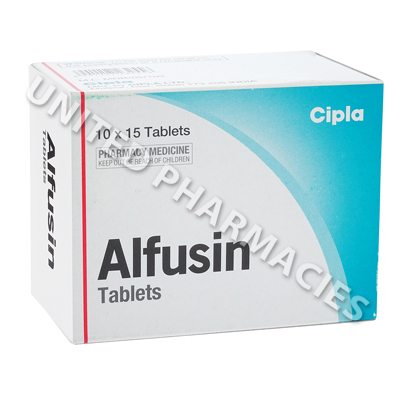 Alfusin (Alfuzosin HCL) is an alpha adrenergic blocker prescribed for men suffering from an enlarged prostate (benign prostatic hyperplasia) and difficulty urination. It works by relaxing the bladder and prostate muscles easing urination. 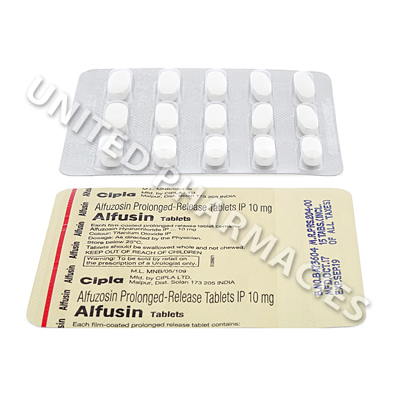 Alfusin (Alfuzosin HCL) is an alpha adrenergic blocker prescribed for men suffering from an enlarged prostate (benign prostatic hyperplasia) and difficulty urination. It works by relaxing the bladder and prostate muscles easing urination. This medication may be prescribed for other uses as determined by your doctor. Always consult your doctor for the correct dosage for you. Never self-medicate or change your dosage yourself. Dosage will vary depending on the individual patient and the exact condition being treated. A typical dosage is 10mg of Alfusin (Alfuzosin HCL) per day, taken after a meal or snack. Each tablet should be swallowed whole without being crushed, chewed, or dissolved. You will usually be required to attend regular appointments to monitor your progress and check for any adverse effects. Keep all appointments with your doctor. 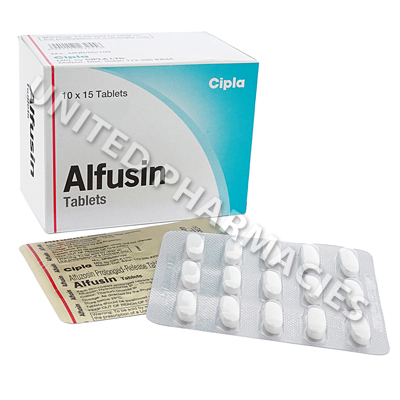 Possible side effects of Alfusin (Alfuzosin HCL) can include mild dizziness, mild fatigue, headaches, low blood pressure, or cold-like symptoms such as a stuffy nose, runny nose, sneezing, or a sore throat. Inform your doctor if any persist or worry you. Immediate inform you doctor if you feel faint, have been vomiting, abnormally sweaty, or experiencing diarrhoea. If you suffer a hypersensitive or allergic reaction to this medication seek immediate emergency medical attention. Alfusin (Alfuzosin HCL) is not safe for use by children or women. Always inform the surgeon if you have any upcoming surgery (including dental surgery).